Office 365 is a hand full package. It includes many services where the key services are SharePoint Online, Exchange Online and Lync Online. As you may have in all the systems, Office 365 also has an admin panel which is called 'Office 365 admin center'. The image below is a screen caption of the Office 365 admin center. You may have access to this or you may not. The main development focused on Office 365 is SharePoint. With SharePoint 2013, its mostly about apps. In this article I will describe how to start creating a SharePoint app using "Napa Office 365 Development Tools". 1. 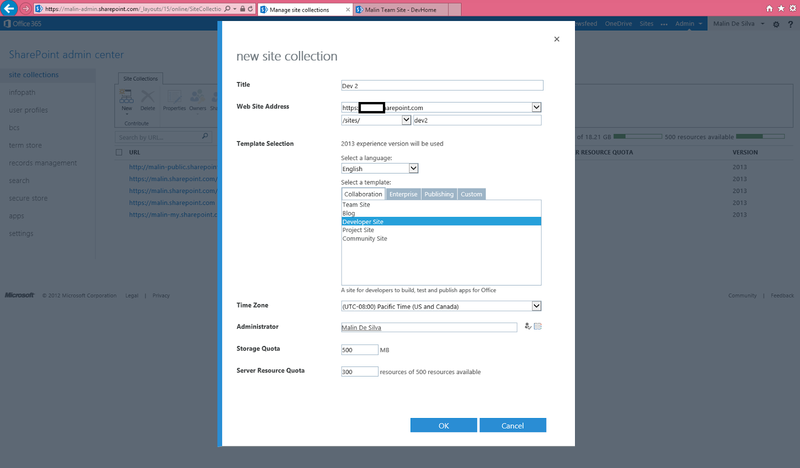 To start developing Office 365 apps, you need to have a site collection with the 'Developer Site' template. Once you select Admin --> SharePoint from the ribbon, you will be navigated to existing site collections. In there select New --> Private Site Collection. A popup window will appear to create a new site collection. In the listing select "“Napa” Office 365 Development Tools"
3. Click on it. You will navigated to app page where 'ADD IT' button is located. Click on it and select 'Trust It'. Now navigate back to Site Contents. You will see the new app added. 4. Click on the tools and you will see all the projects you have created. (Initially it will be empty). Click on 'Add New Project' then a popup window will appear asking 'What kind of app do you want to build?'. Select 'App for SharePoint' from it and give a project name. I will give 'DemoApp1'. 5. Congratulations! you just created your first app. Will do an introduction on the Napa development environment and modifying the content in my next article.